The Empire of Partharia is a collection of several City States, each ruled by a Prince or Princess, that adheres to the City State of Raheed which is ruled by the Emperor or Empress (Currently the Emperor has a wife, who has just as much power and her own agenda). Each Prince or Princess is considered Family to the ruling nobles of Raheed, and they address each other as brother and sister. The Empire was founded nine hundred years after the Empire of Vir Sidus, when the ruling Prince of Raheed led his Army on a path of unification. Though there were many battles, this unification called the Great March of the Sands was mostly people, and brought the people of the Fledgling Empire from worshipping the Many to worshipping the One, and binding the people as family together. The Great March of the Sand was stopped by the Vir Sidus Empire when the Partharians tried to cross the Great Sea River, a saltwater river that seperates the Kingdom of Galenthia and the Empire to the south, and the two Empires clashed in the Empire War. Though this war was short, lasting only two weeks, it firmly cemented the boundaries of the West, and what would become of it when the Vir Sidus Empire fled back over the mountains to the East. The Empire as a nation follows the One Faith but quite differently, calling their priests prophets, and denouncing the misspoken words of the so-called Priests of Rikton. They view their northern neighbors as heretics for how they butcher the teachings of the One Faith, and while polite to them, they refuse to discuss matters of religion unless that matter is conversion to the Prophets of the One. With the exception of a fairly major attempted invasion of Galenthia about four centuries ago, the Empire of Partharia has done little in the way of trying to expand north into the region called the “Civilized West.” They have recently, with the end of the Galenthian Civil War, begun to perform minor military expeditions along the Saltwater River that separates the two nations. These primarily done by the three northern provinces of the Empire’s city states who Galenthia has come to call The Three Princes. They have been little more than skirmishes. Beside their ruling Princes and the eleven city-states that make up the Princedoms, the Empire has a number of nation states to the south that have declared fealty to the Emperor. These are called Client Kingdoms. There are over twenty Client Kingdoms that are little more than tribes, but there are three large ones that hold significant territory. Each Client Kingdom is allowed to govern themselves, and are even allowed their own worship of their own gods, though many have converted to the One Faith through the Prophets. The Client Kingdoms are required to provide tithe to Raheed, and soldiers to the Empire's military in time of need. The bulk of the slave troops come from this requirement. However the three largest each send their own unique specialized soldiers to strengthen the Empire in times of war. Ruling House: Raheed of Raheed. 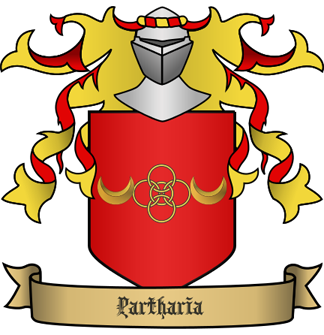 The Military of the Empire of Partharia is based around the individual city-state, and the noble house that rules over that province. The nobles (both men and women) train in martial skills, and they are expected to learn the sacred art of generalship. All soldiers, high born or low, are blessed by a Prophet in the morning, and all households High or Low born are expected to maintain arms and armor for one professional soldier. The Armies themselves are a combination of heavy infantry and cavalry with light infantry as the front line buffers. While the cavalry is certainly led by the nobility, the Empire does not have knights and so the nobility gift horse and spear to worthy individuals who then serve beside them in the various cavalry rolls. These forces are further bolstered by slaves and the Client Kingdoms from the deep south. Cataphract Cavalry: Armed with Sarissa, which are specially mounted pikes, longer than a normal Western lance, and falchions, these heavy cavalry wear scale armor and ride Raheed Stallions, which are massive large warhorses that wear a heavy coat of scales of themselves. These glittering metal warriors are deadly and thunder across any battlefield. Horse Archers: Riding Raheed Mares, Partharian Horse Archers are incredibly fast harriers. Riding ahead or along the flanks, these skirmishers ride forward, shoot, and fall back. Their unique Horse Bows allow for a rapid and accurate firing. Once a volley is released these archers will fall back and move to the flanks to harry the enemy and attempt to cause fear and confusion in their foes. They fire special arrows the whistle in the air but do not sacrifice punching power. Desert Lancers: Riding Partharian Light Chargers, the Desert Lancers wear chain and ride into battle wielding the Sarissa along their Cataphract bretheren. Faster horses, these forces are used to hit undefended infantry or in wide sweeping flanking manuevers. Sometimes they are used as a surprise striking force that come in after a deadly volley from the Horse Archers. Eternal Blades: There are only ever 500 Eternal Blades, and they always travel together. They are the Emperor's (Or Empresses) Will made manifest on the battlefield. They wear striking Black Brigadine armor etched in Light Silver. Their weapons are specially treated steel made and tempered to appear red in color. They go into battle with dual falchions of the Red Eternal Blades except the Eternal Captain who dual wields Sidhe Steel longswords. Each Eternal blade also has no less than 20 throwing daggers on their person and are deadly accurate with them. Eternal Blades lost are usually replaced within the week. Mysteriously appearing at the encampment, trainned and ready. Just as deadly as the man or woman that they replaced. Heavy Spear: The heavy spear infantry of the Empire of Partharia wear scale, the Sarissa, and have hand Axes. Each warrior also travels with three short javelins. They are typically unmovable walls of thorns that hold a battlefield location or slowly trudge into an enemy position to push them off the battlefield. Crossbowmen: Partharian Crossbows are smaller than thsoe in the west, but are more accurate. Having a little less rnage than a Longbow, these crossbows can still puncture armor. Crossbow men are trianed to fire in ranks. A first rank loosing, kneeling, and allowing the rank behind to fire. By the time the third rank has fired, the order is given and the first rank is ready to fire again. This allows deadly, precise and withering fire to be loosed on an enemy. Beside the Crossbow, these soldiers were leather armor and have hand axes to defend themselves in hand to hand combat. Slave Javelins: With maybe leather armor, these slaves are given a satchel of Javalins and rush behind the Horse Archers to throw Javalins at the enemy. These Javelins are designed purely for removing enemy shields. Hammering into them and making the shields unwieldly. If they kill that is just a bonus. Most slaves armed as such generally keep their last javelin so they have a weapon to use in melee combat. Slave Spear: Given a simple spear, these slaves have no armor and are literally throw away troops used to weaken or tire opponents. Slave Heavy Spear: Given a simple spear, a shield, and chain armor, these slaves are used to engage the enemy and tire the opponent. Like all slaves theya re not nearly as trained as the professional troops, but their better armor and shields and formations usually keep them around longer. Thandiwe Skirmishers: Coming from the far southern kingdom of Thandiwe this kingdom is required to supply the Empire with specialy skirmishers and scouts. These Skirmishers carry cowhide shields and go to battle in three throwing spears, and a warhammer. They engage at range trying to drive the enemy back with their throw spears before they fade back. Lwazi Strikers: Wearing Bone Armor and stark White Face Paint, the Strikers of the southern Lwazi Kingdom are fiercesome and manueverable opponants. Their fighting styles are very athletic, leaping and jumping and rolling. They wield a variety of weapons. Closing wiht a throwing spear, and attacking with heavy cudgels, using oblong wooden shields for protection. Zinhle Jaguars: Perhaps the most frightening of the Southern Kingdoms is the Zinhle. These people make a strange bond with a breed of hunting cat that are feared on the hunting plains called Jaguars These creatures are fiearsome and are made even more so when adorned in battle paint and bone armor. Their warriors are just as fierce stalking with their feline counterparts and duel wielding dual pronged Katars that can easily puncture the thickest armors. These warriors wear hardened Leather scale, and move with a fighting grace that would make any soldier nervous.